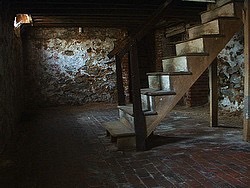 The creepy old stairs led steeply down to the rugged slate floor, now intermittently covered by cement and bricks. This house was old, really old yet would certainly not be called quaint. John had been told by his father once that it dated back to pre-Civil War times, around 1860 or so; Nope, nothing quaint about it. It was a wooden two-story house with a full basement and open attic. Old brown shingles covered the exterior and in the winter substantial storm windows were hung over the numerous portals all around it. 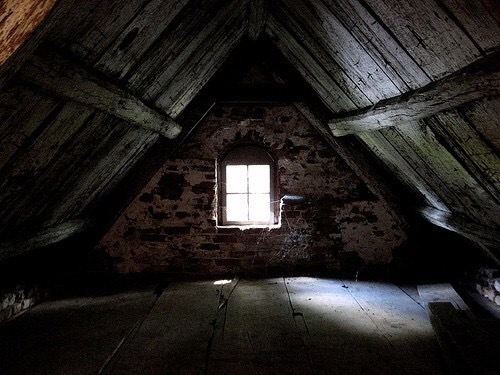 The roof was peaked causing the attic to have a slanted effect requiring anyone up there to bend over while traversing the wooden two by fours comprising the “floor” as they also ran along the interior of the roof. The issue currently though was not the attic. It was The Basement, for this was where all of the “bodies were buried.” Oh not in actuality, at least as far as John could tell the tales of bodies, monsters and lingering spirits were just that, tales. Tales of terror perhaps but still just tales. Tales. Huh! Like tails, monster tales or monster tails? Could be funny, in fact hilarious even as long as one was not subject to the seemingly ghostly atmosphere that prevailed there, in The Basement that is. Oh, he knew it wasn’t real, most times but on occasion apparently more frequently as time went on, John couldn’t shake the feeling, the cognizance, that someone or something inhabited that lower area of the house he called home. Maybe it was not real but it certainly felt like a cold blast of reality to him. So cold in fact, it chilled John to his core, to the very marrow of his life-giving skeletal structure that was made up by the organization of his many bones. Well now, John was determined to outpace this regressive plunge to his previous infantile state of duress and fear bordering on panic, he decided to do what all of the self help books recommended which was to face one’s fears. Confront the challenging boogie men and they would flee! 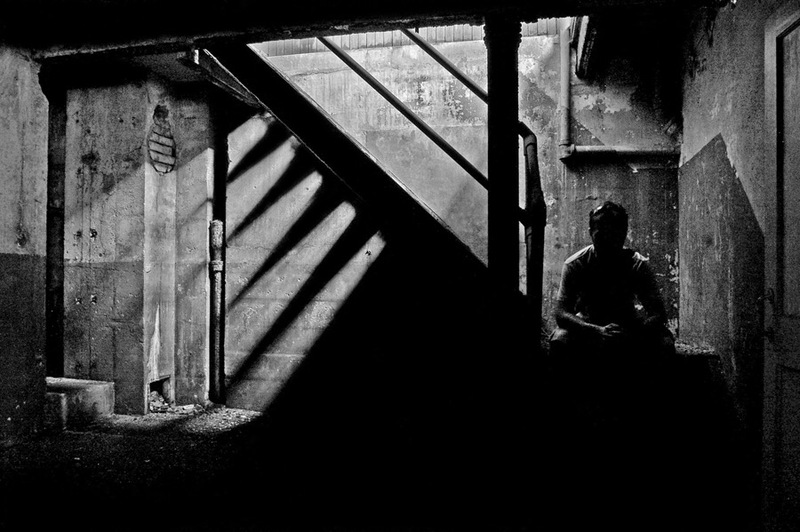 John made his way down the crooked steps, down to the basement he descended slowly,very slowly at first and then picking up his pace, proceeded to tumble-down until he reached the bottom step. The last step, he thought. John got up and straightened himself so he stood erect, almost at attention. 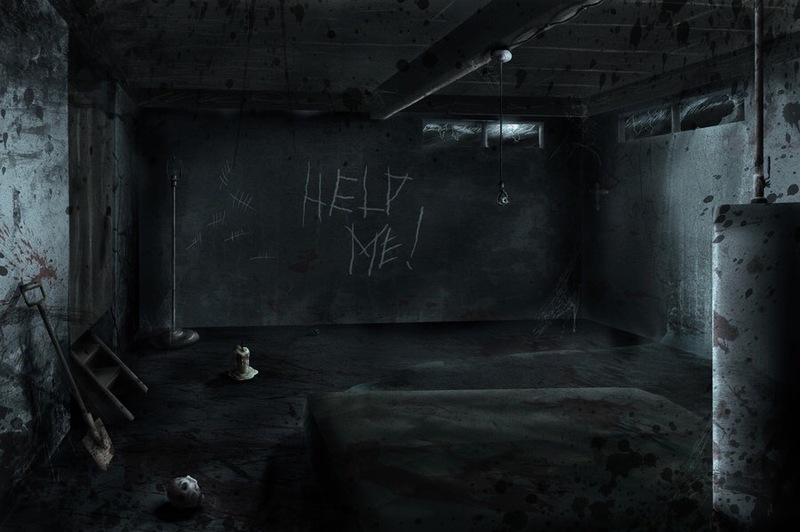 He wanted to be prepared for whatever awaited him in the depths of darkness below the normal area he and the family occupied in the upper rooms. Oh John could handle this, he just knew he could. Why, what was there really to be afraid of down there? Some old wives tales perhaps. The occasional backyard gossip of old women trying to add a little excitement and color to their otherwise bland, colorless days. Ah, machinations of ones over worked and over-wrought cranial muscles, he thought. Just a deviation from normal thought processes perhaps. The oft-times singular, but in the present instance, multiple occurrences of synapses gone bad. Now John found himself sliding, backwards in time to a most sinister place, a place of incomprehensible evil that took up residence in the surreal cobwebs of his mind. He seemed to momentarily float there suspended in an ethereal cloud of thought molecules, breezily wafting through his cranial passageways. A preternatural presence called nothing from nowhere. It was here, now and John was alone-in the darkness of time eternal. Doors opened and closed. Windows, previously open with cool air passing through now shut with a forcefulness that threatened to breach the last remnants of John’s saner moments. This is not happening, he thought. But yes, oh yes this was happening and imagination or not it was real, so very, very real. And John was frightened, John was scared. Very frightened and very alone. ~ by Vinnie on September 26, 2015.